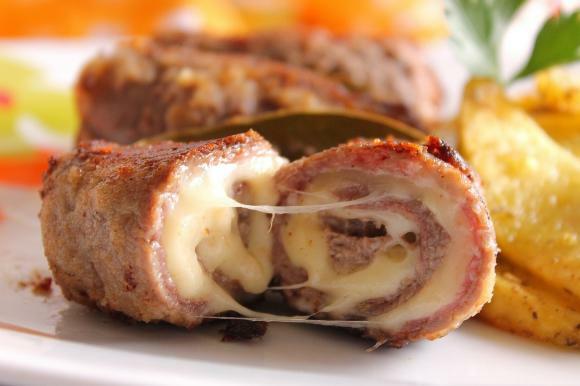 Bombette are small rolls of thinly sliced meat wrapped around a tasty filling. A very flavourful, rustic and intense recipe! Sprinkle salt and pepper on the thin cut meat, then spread pesto all over it. Instead of using a skewer, you can use the stick of the rosemary to seal and hold the rolled meat. Put the bombette in a hot skillet with olive oil. Since it’s really thin cut, it doesn’t take long to cook: a couple of minutes and it’s done. Sprinkle salt and pepper on the thin cut meat, then add parsley and a tiny bit of chopped garlic if you like it. Put a chunk of gorgonzola on the meat. Wrap it, close it and roll it. Use the stick of the rosemary to hold the meat.